Hello Everyone. When I first saw these plates I knew I wanted to wait until a soft, cloudy, maybe snowy day to set this tablescape. Well this is the warmest and most sunny January in a very long time. No Snowflakes in this part of the country! It's afternoon and this room faces the south. I love this room for the cozy and comfortable style. The Snowflake plates are from Tuesday Morning. Gold Beaded napkin rings from Tuesday Morning - Christmas. Handmade napkins. Silver and Gold Snowflakes for a beautiful January Day is a blessing. Thank you so much for visiting today and I want to say a BIG HELLO to my newest followers. Are the snowflake plates Rythm too?! I've always said Homer Laughlin's (made some for Harmony House) mid-century designs are timeless. Thanks for proving my point. What a lovely mix of silver and gold! 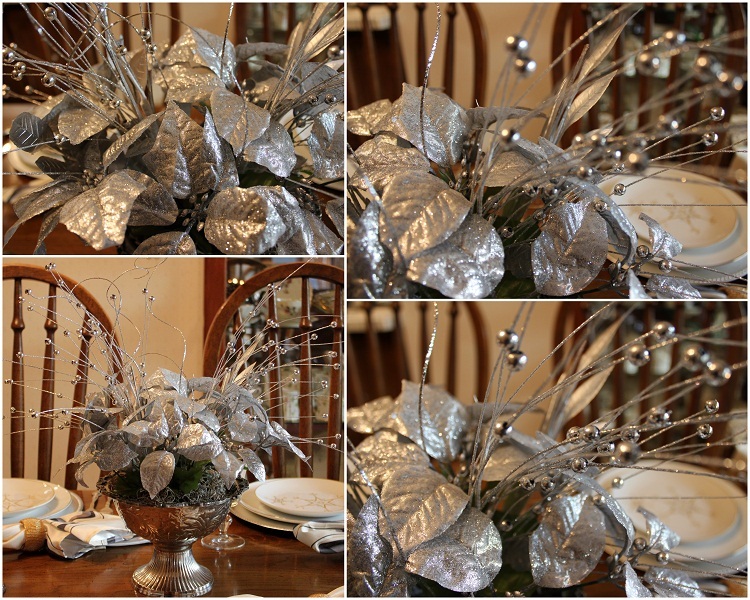 Your centerpiece is really stunning, and it's perfect for your frosty winter table -- even if it wasn't snowing! The plates look great against the bare table. Love your snowy tablescape. I would have guessed those snowflake plates to be vintage - mid-century! Fun.